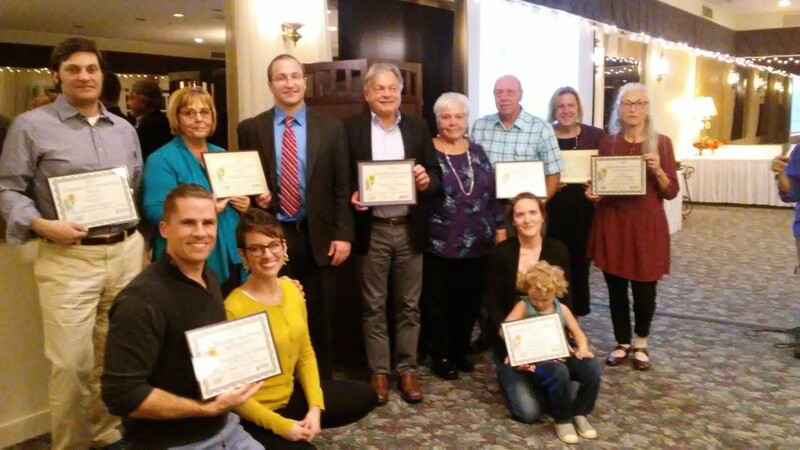 The Tompkins County Community Beautification Program recognized businesses, civic associations, community partners and volunteers who have contributed to beautification efforts at an awards ceremony at La Tourelle on November 2. A new awards program was launched in 2016 to recognize businesses and civic associations that contribute to community beautification in the City of Ithaca and Tompkins County. Winners were selected from nominees in four categories: Business, Civic Association, Residence, and Placemaking. The awards were presented by Tompkins County Legislator Dan Klein. The Community Beautification Award for a Business was presented to Elmira Savings Bank for landscaping around their new branch office on the corner of State and Meadow Streets. This property was an eyesore for years, before Elmira Savings Bank purchased and renovated the building and surrounding property in 2017. The landscaping features shrubs, perennials and ornamental grasses all around the building and parking lot, and has transformed this major intersection in downtown Ithaca. John Strong, branch manager, and his colleague Donna Tangorre accepted the award. The Community Beautification Award for a Civic Association was presented to Linda and Larry Stilwell, members of the Enfield Volunteer Fire Department. Linda and Larry plant and maintain hundreds of flowering annuals as well as hanging baskets in front of the Enfield Fire Station. These plantings add a bright and welcoming swathe of color to the Town of Enfield. The Community Beautification Award for a Residence was presented to Seph Doliner of 202 Utica Street, and Sarah and Brandon Brylinsky of 110 Marshall Street. These adjacent properties feature diverse and colorful curbside plantings, where flowers and vegetables mingle together, and wrap around the corner from Utica Street to Marshall Street. A hollow tree trunk in the plantings is an interesting landscape feature and makes a perfect fort for children. Seph Doliner is also a volunteer with the Beautification Brigade and the Fall Creek Garden Collective. Ithaca Neighborhood Housing Services received the Community Beautification Award for Placemaking for the Lake Avenue walkway, adjacent to the new housing at 210 Hancock Street. This project transformed a formerly straight city street into a winding pedestrian way with landscape plantings and benches placed to view nearby Cascadilla Creek. We look forward to seeing the plantings along this new pedestrian walkway mature over the next few years. Accepting the award was Paul Mazzarella, executive director of INHS. Five volunteers with the Beautification Brigade received the Super Volunteer Award for outstanding service this year: Elke Schofield, Linda Bartnik, Gail Lyman, Carolyn Klass, Carol Beeman, Louise Sallinger and Dan Klein. Community partners were also recognized at the event. GreenTree Garden Supply received an award for partnering with the program to research different custom-blend potting mixes for container plantings. Jeanne Grace, Ithaca City Forester received an award for providing water, mulch and other support for the program. Gary Ferguson accepted an award for the Downtown Ithaca Alliance, which provides staffing to water and maintain plantings on the Ithaca Commons. Paul Paradine of NYSEG was honored for his beautification contributions at the City of Ithaca pump houses on Route 13 and on Cherry Street. Scott Wiggins, owner of La Tourelle, was recognized for hosting the beautification program awards program. The Tompkins County Community Beautification Program is funded by the Tompkins County Tourism Program, with administrative support provided by the Tompkins County Chamber of Commerce. Cornell Cooperative Extension of Tompkins County provides staff and volunteers to plant public sites in the City of Ithaca, and administers a grants program for rural municipalities. The Downtown Ithaca Alliance manages a downtown ambassador program, facilitates waste removal and flower watering, and sponsors an informational kiosk on the Commons. For more information about the Community Beautification Program go to http://ccetompkins.org/beautification or http://www.tompkinscountyny.gov/tourism/beautification. Additional photos from the awards presentation are available upon request. Next:PR: 15 STEPS begins 36th Year In Biz!